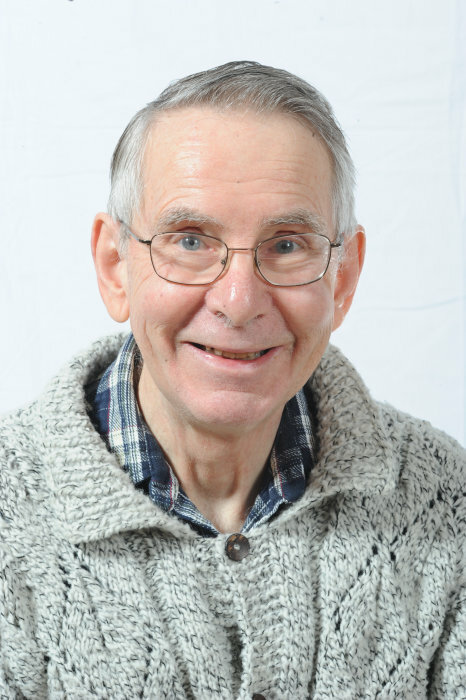 W. “David” Malcolm, Jr., of Peterborough, NH, died peacefully, surrounded by his family at the Rivermead Retirement Community, on February 1st, 2019, from Parkinson's. He was 86 years old. Computer pioneer, storyteller, part-time actor, Renaissance-instrument musician, hiker, mechanical tinkerer, railway and genealogical enthusiast, lifelong Unitarian Universalist, endlessly supportive father and grandfather, and loving husband; these were just a few of the many faces of this kind and gentle soul. Born in Boston, David grew up in Hingham, MA, the son of Walter Malcolm and Violet (Harris) Malcolm, in a home named “Buckthorn” after the trees that lined the driveway. During the 1930's and 40's, David cemented the foundations of lifelong hobbies, built ship and plane models, attended boy scout camps, pursued part-time jobs in apple orchards and gas stations in town, and explored the surrounding woods and streams. As a child, he also attended Hingham's historic Old Ship Church. David was educated at Milton Academy as a teenager, and then entered Amherst College, eventually graduating with a degree in astronomy. He was a member of the Theta Xi Fraternity, and pursued his love of nature through the Outing Club. It was through the latter that he first met Louise, during a school trek to the White Mountains, and the two pursued a love affair that flowered into 60 years of marriage. They were married in a Quaker ceremony in Phoenixville, PA.
A seminal event in his life, post-college, was his two year stint in the army, which formed the basis for some of his most amusing anecdotes. He was wise and lucky enough to be able to parlay his college major into a nomadic odyssey in the Phillipines, Ulithi, Guam, and Saipan with the Army Map Service's Occultation Project. Another important outcome from his army years was the early connection to computer programming, which was at that point a brand-new field. He began working at DATAmatic, which became Honeywell then Bull, and became a dedicated programmer, remaining with the company for 31 years. With the computer company, David moved to Poway, CA for several years, where he embraced the western camping and cowboy lifestyle and desert landscapes, and then relocated back east to Acton, MA, driving a self-modified camper-van back and forth across country to set up homes. Before moving to California, David and Louise built their first home in Sherborn, MA. Travel always remained a passion for David, before and after retirement, and he enjoyed creating elaborate scrapbooks after vacations to Thailand, England (on a canal boat), Iceland, New Zealand, and other places. He was a life member of the Mystic Valley Railroad Society. At 71, He also managed to travel to attend his youngest son's wedding in Thailand. All three of his children served overseas in Peace Corps (two in Thailand, and one in Kenya). David felt like he could never “put his feet up,” even during retirement, which began in earnest in 1988, and he remained as busy as ever with hobbies and projects in his final home of Peterborough. Following his love of nature, he maintained the Raymond Trail opposite his house on East Mountain Road, walked the bounds of Peterborough at the selectmen's request, and was a board member of the Harris Center, Friends of the Wapack, and Monadnock Conservancy. He also served actively at the Peterborough Unitarian Universalist Church, singing in the choir, and serving as the president of the Standing Committee, an Endowment Trustee, and a member of the ministerial search committee. In these latter years, he was able to actively pursue his hobbies of acting and singing and doting on the family cats. He performed in several local community theater productions, and sang with the Monadnock Chorus, which traveled to Scandinavia and Carnegie Hall. He also performed with Lachrimae at Franklin Pierce (an early music group) and sewed his own Renaissance-era costumes. Always fascinated with genealogy, he collaborated on a family history database which reaches back to the 17th century. Diagnosed with Parkinson's in 2003, David approached it with the same wry sense of humor and resolve with which he had faced so many illnesses and difficulties in his life. David leaves behind his wife Louise Malcolm, and three children: his son Christopher Malcolm (of Portland, Maine) and daughter-in-law Susan Malcolm, his daughter Andrea Malcolm (of Princeton, NJ) and son-in-law Bill Gleason, and his son Benjamin Malcolm (of South Korea) and daughter-in-law Supalak Martliam, as well as three grandchildren, Jeffrey and Celia Gleason, and Eben Malcolm. His only sibling, Nancy, passed away in 2008. There will be a celebration of his long and joyful life at the Harris Center in Hancock, NH on April 27, from 2 to 4 p.m. There's still time to send flowers to the Celebration of Life at the Harris Center at 2:00 PM on April 27, 2019.